Heading to a job interview soon? Congratulations! Getting an interview is an accomplishment in itself. Interviews can be nerve-wracking though, especially if you feel unprepared. When your dream job is on the line, you want to make sure that you make a great first impression during the interview process. After all, first impressions are everything. 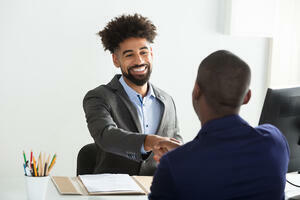 An interview can make or break your chances of gaining employment. At Liberty Staffing Services, we love to see our employees succeed. We would like to provide you with some tips to help you feel prepared for your interview. Here they are! Two very important things that you should remember to bring to your interview is your resume, and your references. It's best to print off multiple copies of your resume. After all, there may be more than one hiring manager that interviews you. You want to get as much exposure as possible, to all hiring managers. Not only that, but you'll appear more professional, prepared, and organized if you have multiple copies of your resume ready. The same goes for your references. Have at least three references ready to go, before you head into your interview. This means that you'll need to contact your references to seek their approval, then provide full details of the reference's contact information to the interviewers (their current place of employment, and how you know them). It's also a good idea to contact your references just before you go into your interview, just to give them a heads up that they may be receiving a call from the interviewer. You don't want your references to be caught off guard. Next, you'll want to plan out your transportation route before your interview. Is your interview in a busy city? Perhaps public transit would be your best option to avoid traffic delays. How long will it take you to reach your interview? When should you set your alarm? These are all important factors to think about. The last thing that you want to do is be late for your interview. It won't make a good first impression. You'll want to arrive at least twenty minutes before your scheduled interview time. It's always a good idea to research the company in preparation for your interview. During the interview process, most interviewers normally ask if you are knowledgeable of their company. Now, you won't know absolutely everything about the company, but it's good to show that you have a basic understanding of the services that the company offers. This illustrates to the hiring manager that you've taken the initiative to learn more about the company, and that you are genuinely interested in the operations of the company itself. Researching the company should also give you a better idea of whether you could see yourself working at the company. And if you are unsure of certain operations of the company, you can always ask the hiring manager during your interview. Remember that you are evaluating the company and hiring managers, just as they are evaluating you, during the interview process. Don't be afraid to ask questions, which brings us to the next point. Read over the job advertisement that you applied to. Is there anything that is unclear about the position? Write down any questions that come to mind, and have them prepared before your interview. You can also ask any questions that come to mind during your interview. Normally hiring managers will ask if you have any questions at the end of your interview. Always ask about the timeline of hiring. Is the employer looking to make a decision about this position this week? When can you expect to hear back from the employer regarding the position? It's always good to ask questions during the interview process. It shows that you are engaged, and interested in the position. We hope that your interview goes well! Need more interview tips? Contact Liberty Staffing today! We would be happy to assist. Megan is a Media Communications professional at Liberty Staffing. She has experience working as a Freelance Writer for a variety of companies online. In her free time, she enjoys crafting, photography, running, and kayaking. An avid reader, she reads anything, anywhere. She puts creativity and passion into everything that she does. Her favourite quote is “Create the things you wish existed” by Anonymous.